Every weekday, Chanel Hines commutes from Walnut Creek across the Bay Bridge to an office building in downtown San Francisco. When she arrives (usually around nine), she logs into her computer, sits down at her desk, and checks her schedule for upcoming appointments. Then she might begin working on a project or head to a meeting down the hall. This sounds like a typical day at the office. But Chanel is 15 and a sophomore at the San Francisco Flex Academy. This is not work; it’s high school. 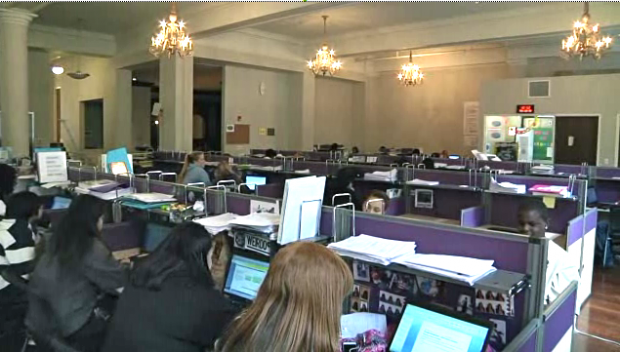 The Flex Academy—housed in the old San Francisco Press Club building near Union Square—is nearly two years into what one of its teachers calls an “interesting experiment,” where students do most of their coursework online, set up appointments with their teachers via email, and sidle up to their classmate’s cubicle if they need help with an algebra problem. Like all of her classmates, Chanel has a cubicle, one of many spaced out in the Press Club’s old banquet hall, with an oaken bar (now empty) off to the side and crystal chandeliers hanging from the ceiling. The atmospheric setting is unique, as is Flex’s academic approach. The 165 students take all their courses online through software provided by the for-profit education company K12. Each semester, the students work through a series of lessons in each of the four core subject areas—English, Math, Science, and History. Plus, they take an online elective from a menu of more than 100 options provided by K12, spanning topics such as Macroeconomics, Audio Engineering, and Art History. (Chanel is currently taking French III). The brunt of the academic work is done online, with each student’s assignments, homework, grades, and assessments tracked and compiled onto an online dashboard that can be seen by their teachers and parents. Some students say they don't even know what grades their peers are in. "In traditional public schools, there's segregation between grades," says student Sophia L. in the school's promotional video. "At this school, I don't really know who's in what grade. I just talk to anybody." You might wonder what Jacquot does if her students take their classes online. Jacquot said her job at Flex is not that much different from her previous job teaching English at a traditional public high school in Illinois. The Flex Academy is located in San Francisco's Press Club building downtown. Jacquot pulls students in individually or in small groups to help them with particular concepts when they're struggling with the online course material. Jacquot says she can track student progress online and target her interventions. 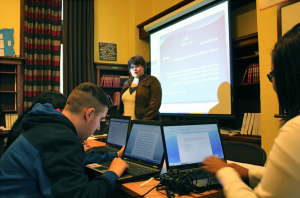 For instance, on a recent school day, a group of students were in Jacquot’s classroom—a converted library with wood paneled bookshelves set into the walls—learning how to add citations to research papers. Kushner and other Flex officials do not shy away from touting the school’s alternative approach. On its Web site, Flex is advertised as “one of California’s first five-day-a-week ‘hybrid’ public high schools.” A makeshift sign in the front window of the San Francisco campus reads: “The Future of Public School Education is Here” -- a bold signals that school officials are confident in their model. In fact, Flex opened a brand new, state-of-the-art campus in Silicon Valley just a few weeks ago. Yet kinks are inevitable. On the same day Jacquot was teaching citations in her class, the wireless Internet went down throughout the entire building. Students working independently at their cubicles soon became restless. In the old banquet hall, some students sat listlessly in their chairs. Others clicked "refresh" on their school-issued laptops with little apparent satisfaction. Conner admitted, beyond mere technical mishaps, Flex is dealing with other growing pains. For instance, he said the student attrition rate last year was too high, the product of students not being prepared for Flex’s different approach to learning. Megan Jacquot teaching a small group of students about putting citations into research papers. “We need to really work on making sure families and students know what this place is about before they enroll,” he said. To that end, Conner said Flex opens up the school for tours every week for interested parents and potential students, so they can see firsthand how students at Flex must be self-motivated in order to succeed. Likewise, Flex officials are learning that even though the school’s academic work is built upon technology and the Internet, students can still waste a lot of time online if not properly monitored. But the Flex program does work for certain students. Senior Albero Berul enrolled in Flex in its inaugural year last year and said he has thrived in his new environment. At Flex, Albero said he has been able to focus on schoolwork and was recently accepted to college in Rhode Island. Despite that accomplishment, Albero said there are tradeoffs to being at Flex. Chanel Hines concurred. She said she used to play lacrosse and soccer at her old public high school, but since Flex has no sports, she now plays on Bay Area club teams. She said she likes her new situation.